I am willing to bet that my son smells better than yours. Unless, of course, yours also uses Old Spice. Adam has been using the entire line of Old Spice products and he smells fantastic. I don’t know many people that can say that about a 13-year-old athletic boy! This review and giveaway was made possible by Double Duty Divas and Old Spice. I was compensated for my participation in this campaign, but all opinions are 100% mine. I said it… My son smells better! Let’s face it, once those hormones kick into gear, your athletic boy turns into a sticky man! Thanks to Old Spice–and a huge shout out to Isaiah Mustafa (the “Old Spice Guy“)–Adam is now a very good smelling dude. He’s been using the Old Spice scent Wolfhorn and it’s honestly the best smelling stuff I have ever been around. My mom is one of those super-sniffers and even she loves it. 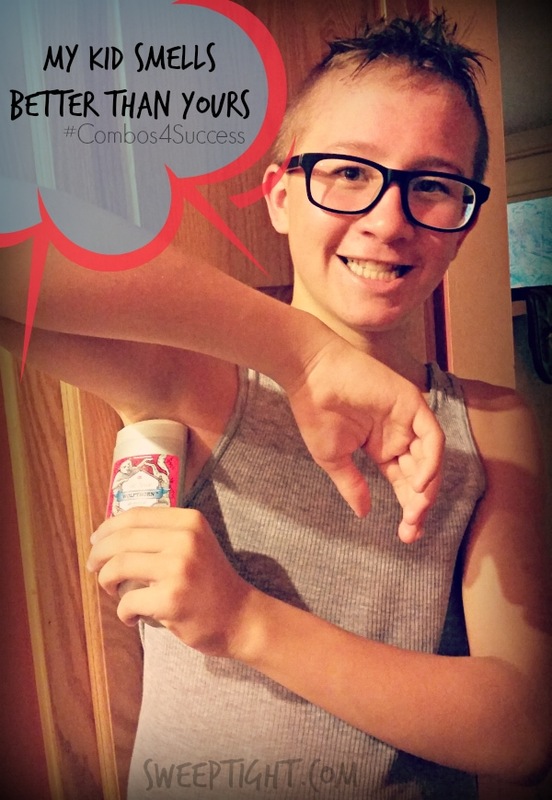 He uses the 2-in-1 Shampoo and Conditioner, the body wash and the deodorant. It leaves him with just enough scent for the whole day. It’s not overpowering at all and gets him through physical education at school and then 2 hours of Taekwondo in the evening! When we interviewed Isaiah Mustafa, he said his favorite Old Spice scent is Hawkridge. I just bought some for Adam, and WOW. I didn’t think anything could smell better than Wolfhorn but Hawkridge may be the new favorite. Although that’s arguable. Ben is a die hard Wolfhorn fan. Whichever your favorite, using Old Spice products for your hair and body creates irresistible freshness from head to toe. The Old Spice Mandroid is hilarious. Check him out! Follow Old Spice on Facebook. Twitter and Instagram too! 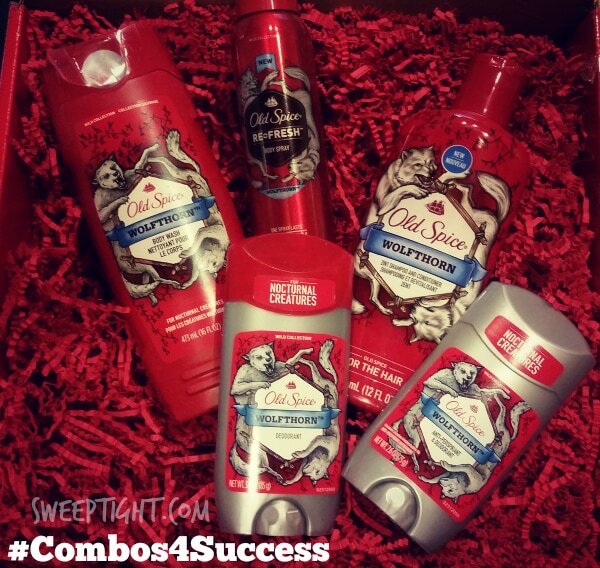 One lucky winner will receive an Old Spice Wolfhorn Head to Toes Prize Pack! Some things are just better together! The manliest men’s grooming brand on the planet is back to inform guys that when they use Old Spice antiperspirant/deodorant, body wash and shampoo together, the result is a manly, amazing, irresistible freshness from head to toes. Your man has clearly already fallen for you (does this look familiar?!) To celebrate great combinations, he can now get stocked up with Old Spice Wolfhorn PLUS a delicious pile of meat to grill up for your next romantic dinner. Win-Win for both you and him! I really want to try the Fiji scent in deodorant and body wash. I would like to win this to give my son so that he can have his Old Spice at work. He is a paramedic and sometimes showers at the station. I would also love to have him grill the “Pile of Meat” from Omaha Steaks! Thanks for the chance to win! I’d like to win this for the menfolk in our family. I would like to win because we love Old Spice products, hubby uses original scent for many years. I really like the wolfthorn deodorant. My son would love to try it. I want to win so I can give it to the hubby for Christmas. Old Spice has always been my favorite scent. It’s a classic. I like the bar soap. I would like to win b/c I’ve been trying to convince hubby to wear aftershave/cologne. I would love if he was into scented products but his grooming routine is basic. If he layered the products, he would smell awesome. I’d like to win so I could give this to my husband for his birthday next month! The Old Spice website was way too funny! I want to win this for my husband. He deserves it! I would love to win this awesome prize pack for my dad because he love and use Old Spice everyday! I’d like to win because I think my boyfriend would like to try some of the new scents and products. I would like to win this for my husband Rodney, because he uses only old spice products. I’d love to win this for dh and ds! I like it when they both smell good!! I would like to win this will be great for my cousin. I would like to win because son’s 13 birthday is coming up. He is growing into a young man and is needing some manly products now. Would also love to cook up the “Pile of Meat” for his party. Thanks so much for the opportunity to enter. I would love to win for my husband who would love this! I would love to win this gift set and give to my husband because I love the scent and he can smell like a MAN! (jk he does already LOL). I want to win because I love using Old Spice products! I want to win the products for my brother and *I* get the steaks. I would like to win because it looks very useful!